Disability, Mental Illness, and eLearning: Invisible Behind the Screen? This article reports on a recent study of students who registered for disability support while studying fully online through Open Universities Australia. The first stage of research was a survey of students who registered for disability support with the organization. This survey found a very high proportion of these students–44.9 percent–identified as people with a mental illness, prompting a second stage of the research where students who had identified as a person with mental illness were interviewed individually. Using this data, the article explores some of the benefits and potential problems students with disabilities experience while studying online, before focusing more specifically on the implications for people with a mental illness. The paper then looks at how mental disability remains a relatively unexplored area of inquiry and how this can partly be explained through the contested place that mental illness holds as an impairment in the broader field of disability studies, particularly in relation to the social model of disability. Finally the article concludes by making a call for further research into best practice for online technological and pedagogical design to better support and enable this group of students. It recommends how the potentially disabling structures of academic institutions could be reformed to better enable a more accessible learning environment. The first step in this process is to recognize these students as having a legitimate impairment that needs to be addressed and accommodated in the contemporary higher education environment. Online education has been a rapidly growing part of the higher education sector over the past fifteen years (Allen and Seaman 2014, 5; Sugar, Martindale, and Crawley, 2007, 365; Wait and Lewis, 2003, iii). When students are fully online we often will not meet them until they graduate. In this context, making sure what is offered is accessible to everyone, particularly students with a disability, is vital. There are a number of advantages to studying online for students with disabilities (see Dobransky and Hargittai, 2006; Fitchen et al., 2009; Roberts, Crittenden and Crittenden 2011). However, online students with a disability can become invisible, and this can lead to unintended accessibility problems. Students with disabilities are underrepresented in tertiary education (see Sachs and Schreuer 2011; Wentz, Jaeger and Lazar 2011), and this seems to be particularly the case in Australian higher education where some estimates put the number of these students as low as four percent (Ellis 2011, 1) compared to between eight and fourteen percent in the United States and United Kingdom (Sachs and Schreuer 2011, para 2). 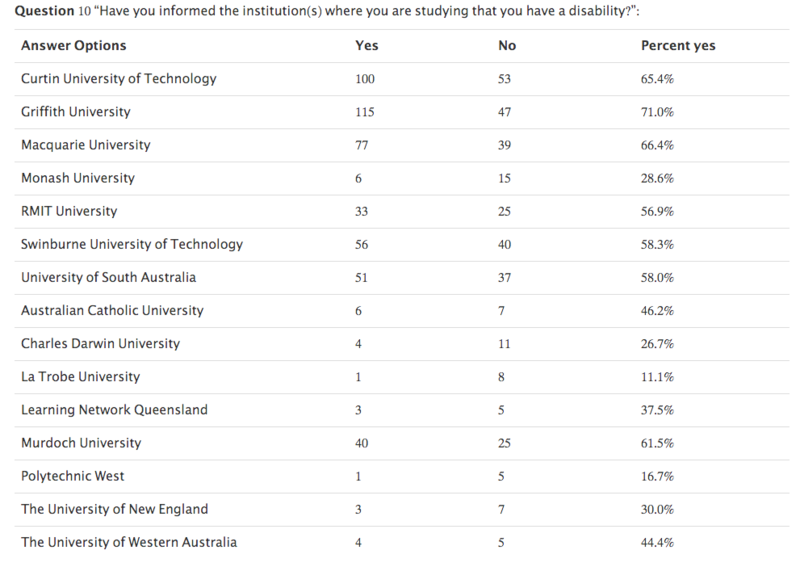 In this context, Open Universities Australia (OUA) had approximately 6.37 percent of the student body who identify as having a disability in 2014. Open Universities Australia is a consortium of seven Australian universities and brings together fifteen different institutions teaching higher education to students fully online across a number of different fields at both an undergraduate and postgraduate level. Each institution involved produces its own online courses that are presented under the OUA banner. OUA offers four study periods a year running back to back for thirteen weeks each. Students are given the option to disclose that they have a disability to OUA as part of the enrolment process; however, privacy legislation in Australia means that OUA does not pass this information on to the specific institutions where the students are studying. As Roberts, Crittenden and Crittenden (2011, 246-247) found, students are often reluctant to disclose that they have a disability–even if it means that they are unable to access course material–a situation that is no doubt made worse if multiple disclosures are required to different organizations. It also means that when students do not come forward, institutions may be unaware of the accessibility requirements of a particular cohort and not construct an appropriate learning environment that would potentially negate the need for disclosure in the first place. In October 2014, an online survey was conducted to explore the attitudes and conditions of students with disabilities studying through OUA. An invitation to participate was sent via email to each of the students that had registered for disability support. The survey explored two key areas; first, the survey focused on how accessible the different online platforms used for teaching and learning by the different institutions were. Second, the survey focused on the student’s level of disclosure to each institution, looking at what motived students to disclose their disability or not, and for those who did, if the accommodation and support offered was effective. The survey also solicited volunteers who might be interested in participating in further follow-up research. From these volunteers, eleven students who identified as having mental illness were individually interviewed to provide further depth to the survey’s results. OUA invites students who register as having a disability to select from eight separate categories of impairments: hearing, learning, mobility, vision, medical, intellectual disability, acquired brain impairment, and mental illness. By mimicking these broad categories, the survey was able to look at the specific impacts of these impairments as they relate to accessibility, disclosure, and the effectiveness of any accommodation offered. The survey sample matched well against the total student body with a disability, in terms of age, gender and types of impairments reported. One of the significant findings of this survey was the number of students in the sample who reported as having a mental illness. Students with mental illness have, in the past, formed a relatively small group of students within the broader disability category. The United States Department of Education reported that for all university enrolments in 2008 among the students who identified as having a disability only fifteen percent reported having a mental illness (as cited in Lee, 2014, 40). However, this study found that within the OUA cohort this number was significantly higher, making up 46.3 percent of survey respondents. OUA does not prominently release its information on the number of students with disabilities. However, when this data is released, the specific impairment categories of intellectual disability, acquired brain impairment, and mental illness are labelled under “other” along with other students who have an impairment that does not map onto one of the five other categories. This “other” category then makes up 54.2 percent of all impairments and serves to mask the high level of students studying through the institution with a mental illness. In the broader community the Australian Bureau of Statistics found that in 2007 the proportion of people with mental illness in Australia was 17.6 percent for men and 22.3 percent for women. In the United States in 2014 the Congressional Research Service quotes studies with figures between 32.4 percent and 24.8 percent using different methodologies (Bagalman and Napili, 2015, 1). If the survey sample was applied to all students who registered as having a disability at OUA, they would be significantly underrepresented, making up only three percent of the student body. The next section will examine the potential of eLearning for people with mental illness. It will also examine some of the barriers presented to this form of learning. It might be pointed out that often these are as much related to pedagogy and the structural nature of higher education than to any specific technology. Further, these barriers are often caused by a lack of understanding and awareness more than active discrimination, a situation that is certainly exacerbated by the relatively hidden nature of mental illness as a disability–particularly in an online environment. This hidden nature, it will be argued, comes not just from the stigma that is often associated with this type of disability, both by people who have mental illness as well as others (Holmes and River, 1998, 231; Corrigan and Rao, 2012, 464), but also from the relationship between mental illness and the disability social justice movement, and the discipline of disability studies that it informs. Before turning more specifically to mental illness, it is useful to position this type of impairment and its relation to the broader issues facing all students with disabilities in the higher education environment, particularly in an online learning and teaching context. There are a number of areas in which eLearning can work to the advantage of people with disabilities when studying in a higher education context. These revolve around the three areas of accessibility, flexibility, and disclosure (Kent 2015, para 11). Online information can be made available in a variety of formats to best suit the person accessing it, whether this is visual through a screen displaying images or text, audio as spoken words and sound, or touch devices such as a Braille tablet or Lorm glove, and increasingly through wearable technologies such as mobile phones and smart watches. There are also a variety of different ways this information can be entered, as well as retrieved, again allowing for greater accessibility for both students and teaching staff with different types of impairments. This is not to say that eLearning sites are always designed to maximize this affordance. Students with disabilities face a range of challenges in higher education and online higher education environments. Borland and James (1999, 89) found students with disabilities felt ‘invisible’ or unimportant within higher education and experienced negative attitudes from staff and other students. Sach and Schreuer (2011, para 8) found students were reluctant to disclose that they had a disability in a face-to-face context, particularly those with what can be considered an invisible disability. In an online context many more disabilities can become invisible (see Ellis and Kent, 2011). Roberts, Crittenden, and Crittenden (2011, 246-247) found that online students were reluctant to disclose a disability, even if it meant that they were unable to access resources that were made available in inaccessible formats. Fitchen et al. (2009, 241), Kelly (2009, para 1-2) and Van be Bunt-Kokhuis and Bolger (2009, 1) all found problems with the accessibility of online content, for instance documents can be formatted in a way that prevents assistive technology such as screen-readers from working properly, and videos can be uploaded without assistive captions for people with hearing impairments. These are problems that need to be overcome through inclusive design of both the technology and pedagogy of online learning; these studies do highlight some of the existing problems in this environment. Among the impairment types that can disappear online, many types of mental illness are a prominent group. This invisibility is often what a student desires, but when coupled with the reluctance of institutions to disclose the number of students in this category it becomes a further barrier to the awareness and intervention required to make eLearning inclusive for this group. In 2014 Open Universities Australia had 42,898 students enrolled. Of these 2,925 identified as having a disability and 1,480 of these had registered for disability support with OUA. This last group of students was each emailed an invitation to participate in an online survey, and 352 students chose to participate. The survey was run through the online Survey Monkey platform and consisted of 17 questions. The first four questions looked at demographics including age, gender, level of education and the impairment type the respondent identified. These responses were broadly in line with the demographics collected by OUA for the full cohort of students to whom the survey invitation was sent. The next two questions looked at how long the person had been a student and the type of study the student was undertaking. Questions seven, eight and nine asked about any accommodation the students might have received as part of their studies, questions ten and eleven looked at issues around disclosure and questions twelve through sixteen looked specifically at technology and online learning systems, and how accessible they were for the students. Finally, question sixteen asked about the student’s opinion of OUA as a place to study, and question seventeen gave the respondents the opportunity to indicate that they would be interested in participating in further research. A summary of the responses can be found in Appendix A. There was a very high response rate to the final question asking if the participants would like to participate in further research with a 63.4 percent positive response. For students who had identified as a person with mental illness this positive response rate rose to 71.1 percent. Given this seeming eagerness on behalf of the respondents to have their voices heard, and the high proportion of students who identified as being a person with mental illness, in 2015 a series of follow-up interviews were held, looking specifically at students who identified as having mental illness. These interviews were conducted online, either through Skype or an exchange of emails, and looked specifically at the impact of this type of impairment on the accessibility of online learning. This second stage of the research was designed to answer calls, specifically from people with mental illness, for research that is conducted “with” not just “on” this group (McWade, Milton and Beresford, 2015, 305). These semi-structured interviews expanded the survey’s focus on technology to also look at teaching practice and pedagogy. An invitation to participate was sent to each of the individuals who had indicated that they would be interested in further research and who had left a valid email address. Eleven interviews were conducted via Skype or email. Six of these reported mental illness as their only impairment, while the remaining five reported multiple impairments including mental illness. In 1999 McLean and Andrews found that university students in Australia with psychiatric disorders faced major problems completing their course of study. They found students suffered problems completing assessment tasks within the timeframe allotted and regularly attending classes due to fluctuating symptoms, as well as stigmatized treatment by staff and other students. ELearning can add to the accessibility of higher education for people with disabilities, and this is particularly true for people with mental illness, although the affordance of this potential accessibility depends on appropriate digital and pedagogical design. There are a number of potential pitfalls for online design that can impact different types of mental illness. People with mental illness will also often have other impairments that impede their access to online content. The interviews indicated this was the case for slightly more than half the people interviewed and the survey found that 41.6 percent of respondents who identified as having a mental illness also identified as fitting into one or more other impairment categories. While in this paper mental illness is referred to in a very general sense, it must be acknowledged that this broad category of impairment can manifest in a wide variety of different manners. The American Psychiatric Association’s Diagnostic and Statistical Manual of Mental Disorders (2013) details 48 different categories of mental illness listed with numerous sub-classifications. This diversity is important to acknowledge as there is always a danger that when compensating for one element of impairment a barrier is created for others. A commonly used example is curb-cuts on the side of the road which make the urban environment less difficult for wheelchair users to navigate, but more difficult for people with a vision impairment who use the raised footpath to identify the edge of the road. While the ability to present different types of information online to different users greatly assists the development of universal design in eLearning, the potential for digital curb-cuts to develop must be considered. Different impairments will require different, and potentially incompatible, ways to navigate around the Web, both at the hardware and software level. Innovations that for example allow greater access for people with vision impairments, such as audio descriptions, will not be accessible by people with hearing impairments (see Ellis and Kent 2011). These mutually incompatible barriers also have the potential to impact across the diverse range of mental illness. The interviews allowed for a more in depth investigation of what type of mental illness this category contained. Of the eleven students interviewed, consistent with the prevalence of different types of mental illness in the broader Australian population, depression and anxiety were two of the most prominent conditions along with post-traumatic stress disorder (Australia Bureau of Statistics, 2008, 8). Of the eleven interviewees six reported having conditions related to depression, four anxiety and four post-traumatic stress disorder, along with one person with obsessive compulsive disorder. Four of the eleven interviewees reported having more than one of these conditions. Two of the respondents reported having previously had episodes of suicidal thoughts associated with their studies. The three areas that make eLearning attractive for students with disabilities are accessibility, flexibility and disclosure. Particularly for students with mental illness, eLearning allows them to avoid many of the problems they might face if they had to attend classes on a physical campus, and have the flexibility to work within the changing parameters of their impairment. Similarly, the affordance provided through eLearning to have more control of the disclosure of their disability, particularly in light of the issues around stigma, is an important feature. The actual process of disclosure could also be difficult in itself beyond issues of stigma. Another student’s experience also showed that it was not always a simple process. Another student also noted that these difficulties extended beyond the disability office and through the whole university institution. Even once they have gotten past issues related to stigma and disclosure, students with mental illness face problems more directly related to the learning environment. The total percentage of students who reported difficulty with accessing online learning platforms due to their disability was slightly lower for students with mental illness, at 16.8 percent compared to 18.7 percent of students in the survey who did not identify as having mental illness. However, the responses from the students who did have difficulty showed a noticeable impact on the accessibility of different online platforms used in learning and teaching for people with mental illness. 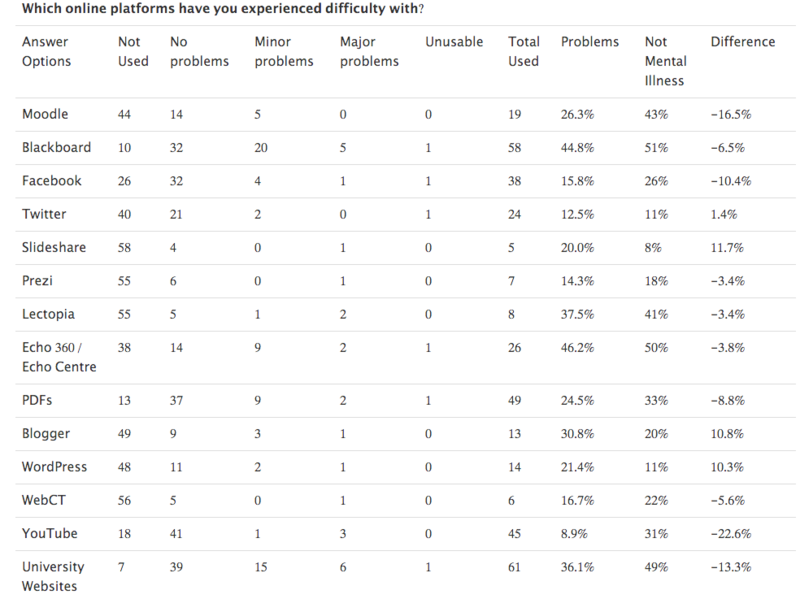 The table below shows the responses to the survey for students who identified as having a mental illness and that had trouble accessing online learning platforms. The second to last column indicates the percentage of students who responded to the survey and did not identify as having a mental illness and the final column the difference between the two. There are clearly large differences in the accessibility of different platforms for students with mental illness compared to other students with disabilities with some platforms seemingly presenting more troubles and others proving to be more accessible. Despite these findings in the interviews students expressed their satisfaction with both the Blackboard platform and the OUA website, amongst others, as can be seen in these comments. As can be seen in the comments about Blackboard Collaborate, social media and websites, as well as the interview and survey responses to Blackboard, a platform that works well for one person may be hard to access for another. As the comment on the OUA website indicates, this can also be the case for the same platform and person in different circumstances. Accessibility problems are not just about online teaching platforms. As Guglielman (2010, 1) observed, eLearning needs to address accessibility and inclusion from both the perspective of technology and pedagogy. This is particularly true for students with mental illness. There were a number of areas related to learning, teaching, and educational design that the students highlighted in the interviews. The students highlight in these comments different approaches to assessment and ways of working through learning content, both in terms of what works and what doesn’t. Comments such as the attractiveness of exams as a form of assessment appear as both positive and negative features. There are some good justifications for the design of assessment that includes hard set deadlines for assignments, the need for physical examinations and group work. However, these need to be considered against the disabling effect they have for many students, particularly those with mental illness. While in most cases a student seeking accommodation for this type of disabling assessment could be easily accommodated, this requires a level of disclosure that many students will not make. This prescribed approach to assessment is not necessary. One of the advantages of eLearning is that it is possible to offer more accessible alternatives to students without requiring any form of disclosure on their part. A unit could offer more than one type of assessment for the learning material to accommodate not just students with disabilities, but also different learning styles in all students. These assessment design problems are compounded by the construction of the university teaching and administration systems. OUA offers four thirteen week study periods a year. While there are clearly operational reasons to keep this rolling period of study, it would also be possible to design units where students can progress at their own pace. This is an approach adopted by Open Colleges Australia–an organization that provides further education in a similar way that OUA provides higher education. At OUA, while a student can withdraw from a unit of study during a study period–and if they disclose that they are doing so due to the impact of mental illness they can normally do so without penalty–they must start that particular unit of study from the beginning in a subsequent study period and redo all assessment that they may have completed up until that point. If they resubmit assignments they had previously completed, it is considered a case of academic misconduct due to self-plagiarism. This is particularly hard for students who might struggle to be able to put in thirteen weeks of work at a time and must normally restart a unit of study from the beginning if they wish to attempt it again. There seems no reason why a student could not suspend their study, rather than withdraw and then re-join the unit in a later study period. Similarly, the institutional arrangements between OUA and the different organizations that provide the programs of study mean that students are faced with having to disclose their disability multiple times if they require any special consideration. As can be seen from the comments above, this is a source of unnecessary difficulty for the students based on meeting regulatory requirements, rather than what is the best for the students. There are good administrative arguments for the existing system; however, these also need to be seen as a significant form of institutional discrimination. Other students also mentioned the importance of access to extensions to provide “breathing space” and a mental safety net and locally invigilated exams. Seale and Cooper (2010, 1108) found that many teachers in higher education see the importance of making eLearning accessible–they are just not sure how. When the prevalence of a particular type of impairment, such as mental illness, is hidden this process is further complicated. The impacts of this can be seen in the use of online learning technology, the pedagogy that underpins the design of online learning and units of study, and finally at an institutional and administrative level. This lack of visibility is in part a consequence of people with disability’s reluctance to disclose that they have a disability. In an online environment, this is further exacerbated for people with mental illness by the stigma that is often associated with this type of impairment. However, mental impairment has always occupied a difficult place in discourses around disability that sets it apart in debates around accessibility and inclusion. Mental illness is often thought of, and treated, differently from other types of impairments. One way to try to understand this may be linked to the way this type of impairment has been conceived, particularly in relation to the social model of disability. The social model of disability first articulated by Michael Oliver (1981), as a contrast to the medical model of disability, places the causes of disability on society, rather than an individual’s body. In this context it is not being a wheelchair user that is the disability; rather it is the construction of inaccessible stairs to gain entry to a building. For eLearning, it is the inaccessible technological, pedagogical and institution design of the learning environment, rather than any problem resulting from a particular student’s impairment that activates disability. While the use of the term mental illness in this paper has been adopted to mirror the label given to the impairment by OUA, a more constructive descriptor is needed with useful ideas and alternative labels coming from Madness Studies, Neurodiversity and Neuroqueer (see McWade, Milton and Beresford, 2015). Mental illness is much like many other impairments, it can come and go and change in severity, and it can develop in a person throughout their lifespan. Also like many other impairments, it is a condition where the disability comes from the construction of society, rather than the individual. Although also like other impairments, the impairment itself has individual consequences (Crow, 1996, 3-4). In this context, medication taken by many people with mental illness to help control their impairment should be seen as more analogous to a wheelchair for a person with a mobility impairment, rather than as a bandage over a wound as it might be more commonly thought of through the prism of the medical model. Mulvany (2000, 586) notes that “People with mental disorders have been excluded from generic disability programs in areas such as employment and training, housing and accommodation support, generic social support, recreation and disability services.” The medical model approach, coupled with the stigma associated with these conditions can also explain why the prevalence of mental illness in online students is also not widely acknowledged and the information is not openly distributed. The high proportion of students who are studying with mental illness shows the urgent need for these existing prejudices to be overcome, particularly in an educational setting. Making access to higher education through eLearning more accessible for students with mental illness, like all design that allows for greater inclusion for people with disabilities, will also make it more accessible for all students. However at this stage there has been limited research into what type of pedagogical design would be a best practice when working with students with mental illness and even less so in an online context. This study has shown that there are three broad areas where reform could make this environment more accessible for these students. The way online technology is used for learning and teaching currently presents a barrier for some students. The pedagogical design of units, particularly around assessment, and the use of group work also need to be closely examined to make it more accessible. Finally, the way that the university is managed and the administrative impact of this on students can currently present significant barriers. It also seems that this group of students has their own ideas about how institutions can be more accommodating to their needs and are eager to share them. These students want to have their voices heard in relation to the accessibility of eLearning. This stands in stark contrast to the invisibility of these students and this impairment category both in broader discussions of disability and also within the student’s own institution. This is a hopeful sign that needs to be embraced, not just by OUA and its partner teaching institutions, but also more broadly across eLearning in higher education. One of the concerns about people with disabilities and eLearning is that as people with disabilities study online they disappear behind the screen, out of sight of the analogue campus, and as a consequence, issues of inclusion and access lose their potency as this group loses their visibility. Online through OUA we see people with a mental illness have a more serious problem–they have disappeared behind the screen, but even online their presence is masked by both the students themselves and by the institution as they disappear into the “other” category of disability. While this study has focused on students studying through Open Universities Australia, and thus fully online, many of the issues raised here are also pertinent to the growing number of students who are studying some, if not all, of their degree online or though the recently conspicuous Massive Online Open Courses (MOOCs) (Allen and Seaman 2015, 5-6). The first step to advocate for change is to create a sense of solidarity within a group and to then use these numbers to agitate for change. The invisibility of this group of students makes this task particularly problematic. But the high numbers of these students in this area of higher education demands the attention of those who manage learning technology, teaching, and institutions. If these relatively high numbers of these students involved in eLearning are repeated across the increasing number of higher education courses offered online then this research needs to be seen as a matter of significant priority. The interview phase of this research was conducted with funding from the National Centre for Student Equity in Higher Education https://www.ncsehe.edu.au and the Australian Commonwealth Government. I would also like to thank the editors of this special issue, Sushil Oswal for his valuable work in improving this article through the peer review process, and Andrew Lucchesi for inviting me to submit to this issue and seeing the issue into publication. Allen, Isabel Elaine and Jeff Seaman. 2014. Grade change tracking online education in the United States. Babson Park, Mass: Babson Survey Research Group and Quahog Research Group. American Psychiatric Association. 2013. Diagnostic and statistical manual of mental disorders: DSM-5. Washington, D.C.: American Psychiatric Association. Australian Bureau of Statistics. 2008. National survey of mental health and wellbeing summary of results. ABS Web Site. [Canberra]: Australian Bureau of Statistics. Bagalman, Erin and Angela Napili. 2013. Prevalence of mental illness in the United States data sources and estimates. [Washington, D.C.]: Congressional Research Service, Library of Congress. Borland, John and Sue James. 1999. “The Learning Experience of Students with Disabilities in Higher Education. A case study of a UK university”. Disability and Society.14 (1): 85. Chappell, Anne Louise, Dan Goodley, and Rebecca Lawton. 2001. “Making connections: the relevance of the social model of disability for people with learning difficulties”. British Journal of Learning Disabilities. 29 (2): 45-50. Case, D. Elizabeth and Roseanna C. Davidson, R. C. 2011. “Accessible online learning”. New Directions for Student Services. 2011. (134): 47–58. Corrigan, Patrick W. and Deepa Rao. 2012. “On the self-stigma of mental illness: stages, disclosure, and strategies for change”. Canadian Journal of Psychiatry. Revue Canadienne De Psychiatrie. 57 (8): 464-9. Crow, Liz. 1996. “Including All of Our Lives: Renewing the social model of disability”. In Morris, Jenny. 1996. Encounters with strangers: feminism and disability. [London]: Women’s Press. Dobransky, Kerry and Eszter Hargittai. 2006. “The disability divide in internet access and use”. Information, Communication & Society. 9 (3): 313-334. Ellis, Katie. 2011. “Embracing learners with disability: Web 2.0, access and insight”. Telecommunication Journal of Australia. 61 (2). Ellis, Katie and Mike Kent. 2011. Disability and New Media. [New York and London]: Routledge. Fichten, Catherine S., Vittoria Ferraro, Jennison V. Asuncion, Caroline Chwojka, Maria Barile, Mai N. Nguyen, Ryan Klomp and Joan Wolforth. 2009. “Disabilities and e-learning problems and solutions: An exploratory study”. Educational Technology and Society. 12 (4): 241-256. Goodley, Dan A. 2001. “’Learning difficulties’, the social model of disability and impairment: challenging epistemologies”. Disability & Society. 16 (2): 207-231. Holmes, E. Paul, and L. Philip River. 1998. “Individual strategies for coping with the stigma of severe mental illness”. Cognitive and Behavioral Practice. 5 (2): 231-239. Leaver, Tama. 2014. “Facebook Student Engagement and the “Uni Coffee Shop” Group”. In Mike Kent and Tama Leaver. 2014. An education in Facebook? : higher education and the world’s largest social network. [New York and London]: Routledge, 121-131. Lee, Barbara A. 2014. “Students with Disabilities: Opportunities and Challenges for Colleges and Universities”. Change: The Magazine of Higher Learning. 46 (1): 40-45. Macdonald, Stephen J. 2009. “Windows of Reflection: Conceptualizing dyslexia using the social model of disability.” Dyslexia. 15 (4): 347-362. McLean, Patricia and Jana Andrews. 1999. The learning support needs of students with psychiatric disabilities studying in Australian post-secondary institutions. Leabrook, S. Aust: NCVER. Muilenburg, Lin Y. and Zane L. Berge. 2005. “Student barriers to online learning: A factor analytic study”. Distance Education. 26 (1): 29-48. Mulvany, Julie. 2000. “Disability, impairment or illness? The relevance of the social model of disability to the study of mental disorder”. Sociology of Health & Illness. 22 (5): 582-601. Roberts, Jodi B., Laura A. Crittenden and Jason C. Crittenden. 2011. “Students with disabilities and online learning: A cross-institutional study of perceived satisfaction with accessibility compliance and services”. The Internet and Higher Education. 14 (4): 242-250. Seale, Jane and Martyn Cooper. 2010. “E-learning and accessibility: An exploration of the potential role of generic pedagogical tools”. Computers & Education. 54 (4): 1107-1116. Sugar, William., Trey Martindale and Frank E. Crawley. 2007. “One Professor’s Face-to-Face Teaching Strategies while Becoming an Online Instructor”. Quarterly Review of Distance Education. 8 (4): 365-385. Tregaskis, Claire. 2002. “Social Model Theory: the story so far”. Disability and Society. 17 (4): 457-470. Waits, Tiffany and Laurie Lewis. 2003. Distance education at degree granting post secondary institutions: 2000-2001. Washington, DC. : U.S. Department of Education, National Center for Educational Statistics, NCES 20003-017. Wentz, Brian., Paul. T. Jaeger and Jonathan Lazar. 2011. “Retrofitting accessibility: The legal inequality of after-the-fact online access for persons with disabilities in the United States”. First Monday. 16 (11). Question 1 “In what year were you born?”: The average age of the respondents was 42 years, with the oldest 85 and the youngest 15. This compared to the average age of 36 years for all students registered with disability support through OUA. Question 2 “What is your gender?”: There were 71.4 percent female responses, 27.5 percent male and 1.1 percent preferred not to say. This was broadly in line with the gender ratio for all students registered with disability support through OUA of 70.4 percent to 29.6 percent. Seventy students responded to this. 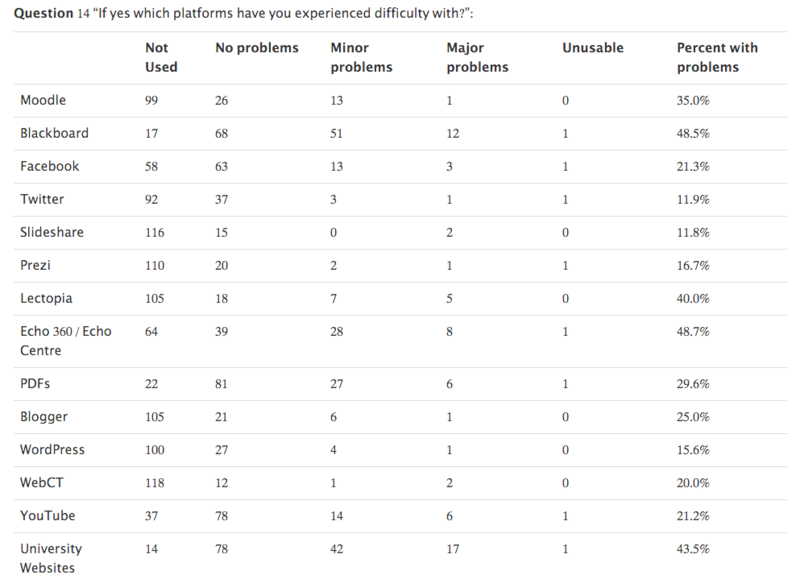 Twenty indicated that there were no other platforms they had trouble with, and the remaining 50 predominantly took the opportunity to expand on the problems they had with the platforms suggested above, and also highlight problems with inaccessible course material. 226 students, 63.4 percent of the people who took the survey, responded to this. Mike Kent is the head of department and a senior lecturer in the Department of Internet Studies at Curtin University. Dr Kent’s main research interests focus on the two main areas of tertiary and online education, as well as people with disabilities and their access to communications technology. He is co-author, with Katie Ellis, of Disability and New Media, (Routledge 2011), and co-editor (with Tama Leaver) of An Education in Facebook? Higher Education and the World’s Largest Social Network (Routledge, 2014). His work has also been published in a number of academic journals including The Journal of Online Learning and Teaching, Digital Culture and Education, Disability Studies Quarterly, Disability and Society, and M/C Media Culture. His current research includes the forthcoming books Massive Open Online Courses and Higher Education: Where to Next? (Ashgate) with Rebecca Bennett and Disability and Social Media: Global Perspectives (Ashgate) with Katie Ellis.